The IMS Global Learning Consortium (IMS Global/IMS) is a highly effective nonprofit, member organization that strives to enable the adoption and impact of innovative learning technology. 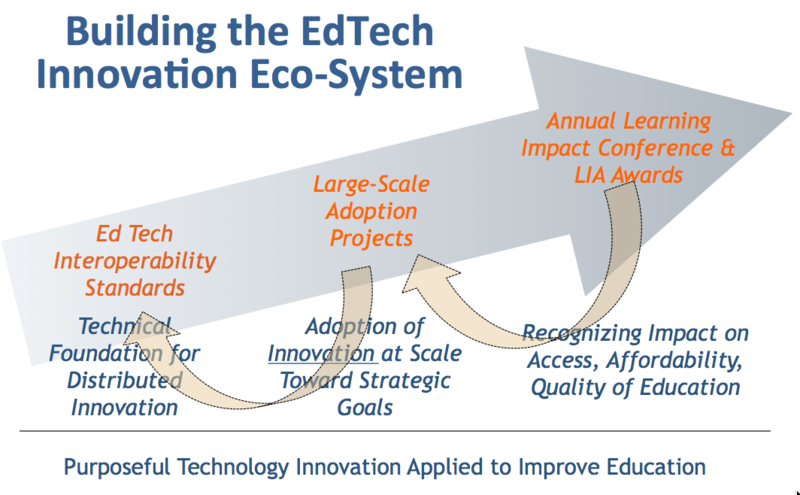 The IMS open architecture and extensive ecosystem of EdTech products enable education institutions to be more innovative, provide a more seamless user experience and dramatically reduce the cost of integrating products into the educational enterprise systems. IMS Global members participate in any or all of the aspects of the IMS work: from standards creation to adoption of edtech innovation to large-scale deployment of technology to achieve learning impact (improving access, affordability and quality of learning). The interaction and feedback among these three "stages" of market adoption are critical to the success of the open architecture and the fostering of new opportunities throughout the sector. IMS Global is supported by the IMS members– the world’s leaders in educational and learning technology. Leadership in IMS comes from K-20 institutions as well as EdTech suppliers, including leading learning technology product suppliers and publishers, leading institutions of learning and training, and leading government and professional consortia. IMS is organized under the U.S. tax code as a non-profit membership organization. IMS operates under a world-class intellectual property rights (IPR) policy and the provisions of the National Cooperative Research and Production Act, providing maximum IP and antitrust protection on behalf of the members and the millions of users of IMS standards around the world. IMS Global is managed by the IMS Board of Directors, who represent an IMS Contributing Member organization as well as the sector at large. A majority of the Board are elected by the Contributing Members. In 1995, IMS came into existence as a project (the Instructional Management System project) within the National Learning Infrastructure Initiative of EDUCAUSE. In 1999 IMS Global spun out of EDUCAUSE to become an independent non-profit organization. While IMS got its start with a focus on higher education, the specifications published to date as well as ongoing projects address requirements in a wide range of learning contexts, including of course K-12 schools and corporate and government training. IMS continues to have a close relationship with EDUCAUSE and numerous other education and training associations. IMS Global also has numerous partnerships with standards-setting groups and government bodies around the world. IMS has published a broad range of learning technology interoperability standards available under a royalty-free license. Standards development are led by member-based workgroups from various parts of the world, depending on need and interest. IMS also provides robust developer communities to aid in adoption of IMS work, including sharing of open source code libraries, reference implementations and conformance certification. End-user organizations established numerous advisory groups in specific areas to develop institutional best-practice and how to guides, as well as to guide the priorities of IMS technical work. The formal name for IMS is IMS Global Learning Consortium, Inc., also sometimes referred to as IMS Global or IMS GLC. The original name, when IMS first started in 1997 was the Instructional Management Systems (IMS) project. Over time, many other names became more popular, such as Course Management System, Learning Management System, Virtual Learning Environment, etc. Therefore, IMS kept the acronym but to stand for a much larger body of IMS work to date and into the future.